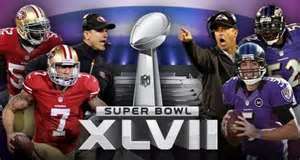 SuperBowl 47 will be remembered for many things – a 30 minute power outage delay, the Harbaugh brothers coaching against each other, an epic comeback attempt by the 49er’s, and a couple of SuperBowl records for longest kickoff return for a touchdown and longest singing of the National Anthem. And today the internet is filled with opinions of how the Ravens were able to hold on to the win and with reasons the 49er’s were unable to finish the comeback on top. But the bottom line is both teams were well coached, had a well thought out gameplan, both came fully prepared to play and both faced the same adversity during the power outage. In most every game, the team who’s players execute the plays and trust in the coaches to know the best play to call in any given situation, end up with the victory. Yesterday it was the Ravens who simply executed the plays relayed to them onfield from the coaching staff better and more consistently than the 49er’s. God knows and can see the big picture for our life. He is our coach who is there to direct us into His perfect will for our lives. He wants us to experience victory over sin and the things like unforgiveness, bitterness and anger that keep us from experiencing all He has planned for us. He gives us instruction or “sends in a play” to us from the sideline either through His word or through the wisdom and advice of others. He calls in to us the right “play” at the right time so that we may successfully move forward and grow in our faith. We get in trouble when we look at the situation on the field and decide that we know best which play to run so we change the play last minute at the line of scrimmage. Whether He instructs us to make a move in a new direction or to stay put where we are and trust in His timing, it’s our job to execute according to the His play call, not our own. When we fail to follow His lead we find ourselves stuck in circumstances without hope for a way out. 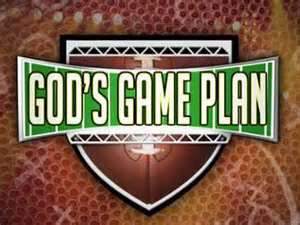 Thank God He has an endless playbook and even when we fail, He continues to give us opportunities to follow His gameplan. I remember a time in my life when I had prayed to be able to quit my job so I could be a stay-at-home mom. I waited on God and followed the path I felt He was leading me on. That path included staying put in my job for 2 more years after I began praying to be home. But when God opened the door for me to quit my job and stay at home, my lack of faith in the moment caused me to change the play He had called, to one according to how I thought things should go. I quit my job but instead of becoming a stay-at-home mom full-time, I decided I should work part-time so that I could continue to bring in income for our family. 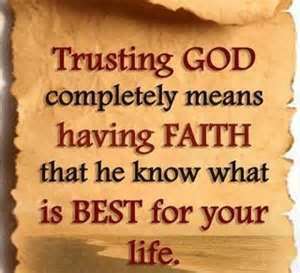 I didn’t trust God to be our provider and to meet our needs. Within a month of working as a bank teller part-time, my cash drawer came up over $1000 short. I was given 3 days at home without pay while they investigated to determine where the missing money was. It was in those 3 days that God clearly showed me that He never told me to go to work part-time. He had fully opened the door for me to stay at home, which was my heart’s desire. He was trying to give me what I had asked for but I lacked the faith to receive it. I changed the play based on our financial circumstances I saw with my own eyes instead of trusting Him enough to execute the play as He had called it. I repented and knew when the 3 days were up the bank would call to tell me I was fired for not doing my job and causing my cash drawer to be short. And then I could start being at home full-time which I knew then was God’s plan for me. To my suprise they called after 3 days and although they had been unable to account for the money, they offered for me to return to work because they believed it was an honest mistake and the money would turn up upon further investigation. God didn’t just shut the door on my mistake, He gave me the opportunity to run the play again and this time to execute it according to His plan. I returned to work and gave my notice thanking the bank for their confidence in me and explaining that I had decided to completely trust in God to provide for our family so that I could be at home with my children full-time. If you are going through a difficult time, you are faced with a hopeless situation or you have prayed for a change in your circumstances – look to God for direction. And when He calls in a play through His word, through the counsel of other believers or through a gentle whisper to your heart, execute the play exactly as it was called no matter how things appear. Remember, He sees the big picture that we cannot and it’s in the times we choose to trust in Him and the play He’s called for our lives, that He reveals enough of that picture to give us hope to keep going and to grow our faith in Him alone. 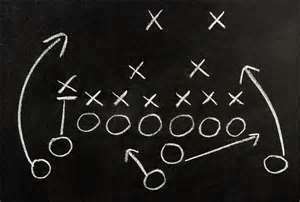 Stick to God’s gameplan and in His timing you’re guaranteed to receive the victory you seek. « Is It Live or Is It Memorex? This is exactly what i needed to hear today. I miss u so much and our random talks. 🙂 i know this move was Gods plan however it is hard to leave friends that have become your family. Thanks for always being there.